Summing values by a condition may sound easy. If not, please see Crunch Data Even Faster with the SUMIFS Function article as well. You can easily sum values by condition(s) with SUMIF and SUMIFS functions; with a limitation. 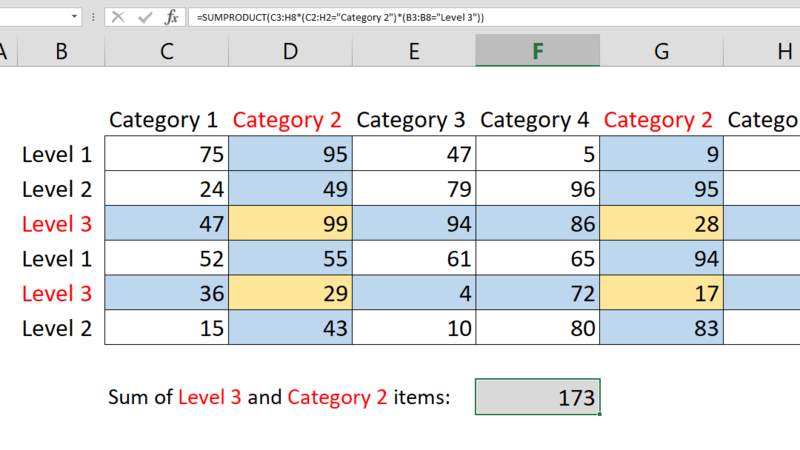 The sum range and criteria ranges should have equal sizes. Because 2d criteria range is not a common scenario, this article explains how to sum 2d ranges by conditions using SUMPRODUCT function. The SUMPRODUCT function’s ability to handle arrays provides an advantage over the limitations of SUMIF and SUMIFS functions. If you analyze the formula deeply, you realize that each criteria range and criteria equality pair returns Boolean arrays that contain TRUE/FALSE values. Converts TRUE/FALSE values into 1/0 numerals respectively. Note: Comma (,) represents columns and semicolon (;) represents rows. Multiplying the sum range and 1/0 array also returns another array that contains only filtered values because other values are eliminated by 0’s. The SUMPRODUCT function adds the values of its argument array.